A “Motivated” laryngeal examination is an examination in which the clinician “pushes” the larynx to reveal its secrets. If topical anesthesia is used, this can be done without undue discomfort to the patient, and laryngeal images can be close and clear rather than far and fuzzy. 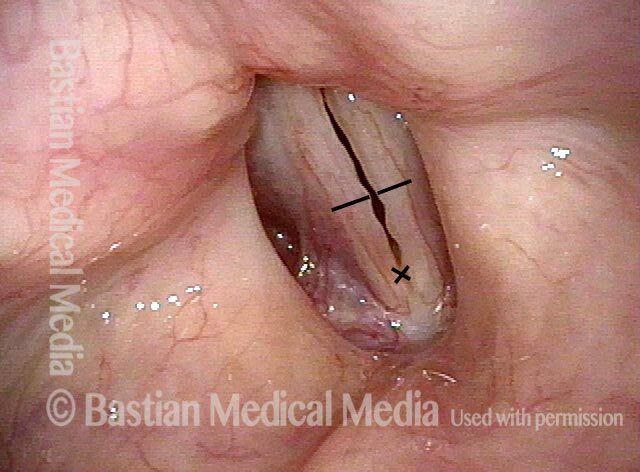 Typical view for laryngeal videoendoscopy or videostroboscopy. A few years earlier, this patient underwent superficial laser cordectomy of the right vocal cord (left of photo) for cancer. The voice result is excellent, and the patient is being seen this day for a routine interval examination, and has no new complaints. At closer range, two findings become evident. First, permanent capillary reorientation is seen (inside the white dotted oval), which is typical after superficial cordectomy; note the more jagged and left-right capillary patterns. Second, tiny points of leukoplakia (inside the green dotted oval) become evident on the opposite vocal cord. The bright white spot in the photo is just a light reflection. After vigorous throat clearing, and using a view that is closer still, capillary and leukoplakia findings are confirmed. Note that the brilliant white light reflection is now in a different location. Still closer view, again confirming the tiny patches of leukoplakia. Breathing position, standard light in a young woman with longstanding HPV-6 infection. Voice remains quite good, many months after her last microsurgery with cidofovir injection. The only obvious “lesion” is posterior right cord (left of image) but the characteristic punctate vascular marks are not seen. The black lines are purely for use to orient photo 4. With such a clear voice, this prephonatory instant under strobe light reveals a surprising degree of vocal cord margin “serpentine” irregularity. Black lines again support orientation with photo 4. At very close range and also using narrow band light, the tiny punctate vascular marks are seen in the lesion first seen in photo 1. Faint vascularity like that demonstrated here can be a correlate of relatively stable, inactive disease, which has clinically been the case here. This narrow band view includes only the anterior half of the vocal cords from the black lines of photos 1 and 2 to the anterior commissure (at x). Inside the faint circles, note the vascular markings that suggest papilloma formation to explain the serpentine margin. A person with chronic hoarseness. Working from a “typical” laryngeal examination photo alone, one might suspect vocal nodules. 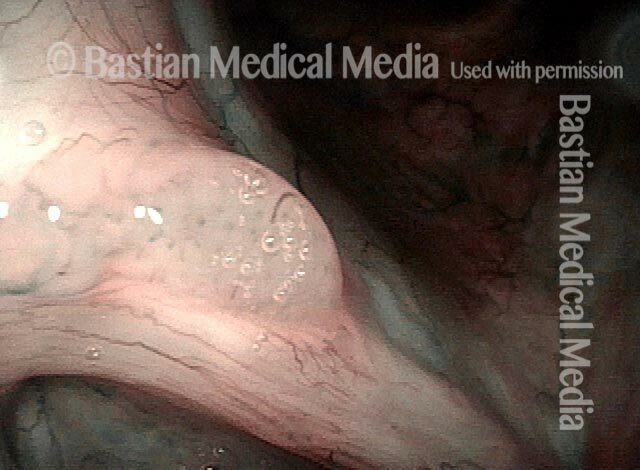 By going to the trouble of getting an extremely close-range view such as this one, requiring use of topical anesthesia, one can see what appear to be papillomas, with stippled vascular effect associated with HPV-related disease. RRP is in fact the biopsy-proven diagnosis and papillomas are indicated by arrows.